Micka loves drawing and wants a pup, but with older brothers into violence and petty crime, and a mother who can't read the notes his teacher sends home from school, neither he nor the pup stand much of a chance. Then a new boy, Laurie, starts at Micka's school. The two boys both have vivid imaginations, but Laurie's fantasies are of magic and revenge, and he soon pulls Micka into a dangerous game where the line between make-believe and real life - and, ultimately, death - is increasingly blurred. Written in direct, uncompromising yet compassionate prose, and with a breathtaking clarity of insight, "Micka" is an astonishingly assured debut - and an unforgettable story. '"Micka" feels like a book that wrote itself ...Frances Kay is an accomplished story teller who has found her darkest tale' - Anne Enright. 'I read this at a single sitting. 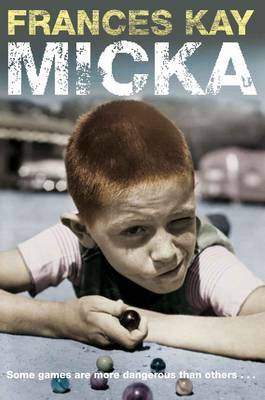 Once started it was impossible to put aside ...Atomising and searing, "Micka" is a remarkable first novel' - Carlo Gebler. The book was very well written, I couldn't put it down. managed to keep you fearing the worst! !